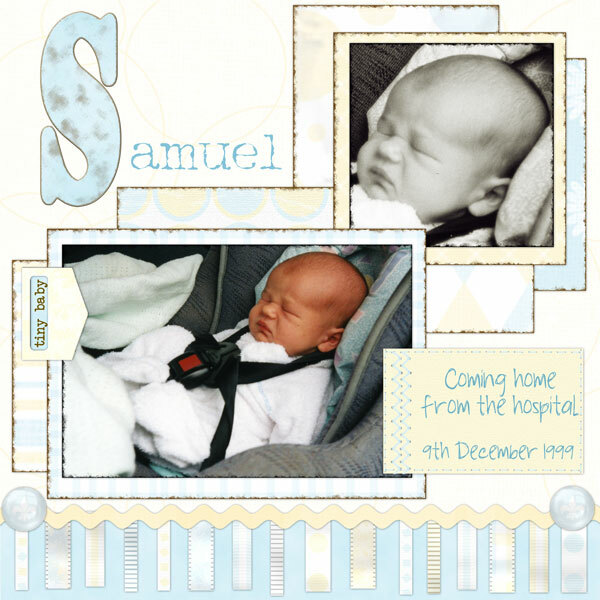 Ok, so I’m too hot to be bothered doing much today…..
Here’s Samuel’s layout, as promised. I totally love how it came up, great work honey. Papers and elements and all those yummy yummy ribbons from Fernlili’s Announcing Ethan kit. Told you it had heaps of elements in it!! Fonts used were Adonis, Another Typewriter, FB Sunrise and Halbstarke. And again I used the Inked edge and chipboard actions from Atomic Cupcake. Yummy !! I just can’t believe he was ever so tiny – those are his feet curled up just past that buckle. Well, ok, he’s still on the small side, but he looks like a doll here…Ok, the floors are calling me, gotta go.